Sometimes, things just work out. My partner, Ben, was going to be attending a work conference in Nice in April and we could take a bit of time off work beforehand to travel. 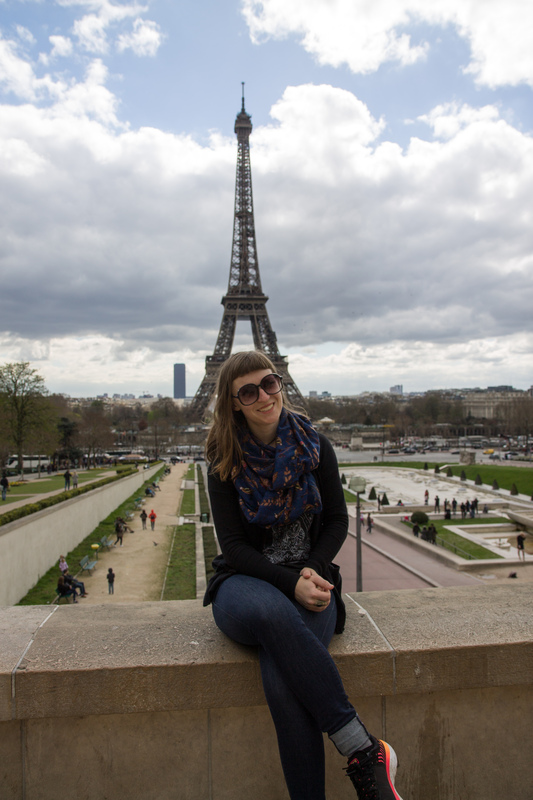 Even better, my friend, Ellie, was living and working in Paris so we could visit her as a part of the trip. Ellie and I ran our first marathons at around the same time, and though she has outperformed me by far since then, running a bunch of others, we had been talking about doing one together for a while. So, when Ellie pointed out that the Paris Marathon would be taking place when Ben and I were planning to visit, we decided to sign up. It would be my second marathon. I started training in mid-December after returning from Mexico. Training for a marathon is difficult. It takes a significant chunk of time and your body gets tired (which, on some training weeks, is the point). I work full-time, and I would get home during the dark and rainy Seattle only to have scheduled a ten-mile hilly training rain, after which I would pretty much only have time to eat and go to bed. But, I wasn’t unhappy with this for the most part; the prospect of going to Paris and running the marathon with Ellie was something I was very much looking forward to. Tip: if you’re training for a challenging race, planning on a destination event really helps your motivation! I find the skills I have gained from running help me travel (especially solo), and vice versa. If you’re running, you have to be okay with a certain level of discomfort. You also have to be comfortable on your own (unless you are lucky enough to always have a running buddy) and able to spend time in your own head without stirring up too much anxiety. And, importantly, despite sometimes feeling nervous or reluctant, you have to take the first steps—almost always you’ll be really glad at the end. 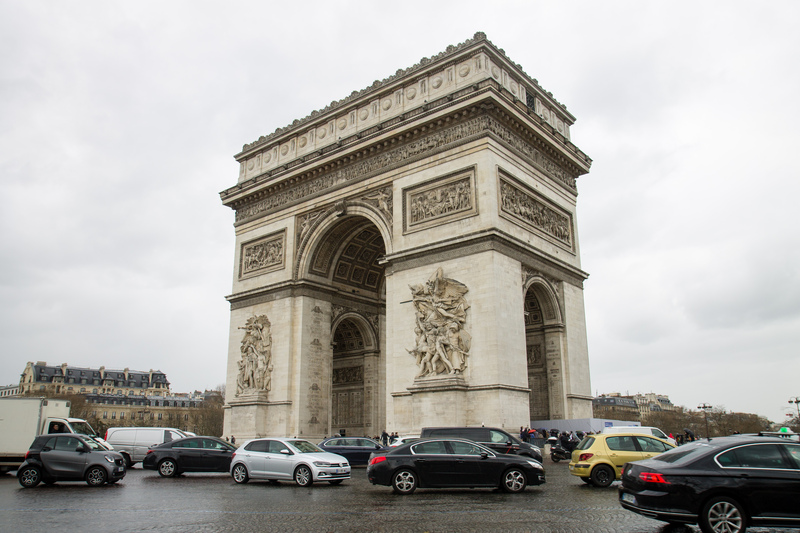 The race starts at the Arc De Triomphe. 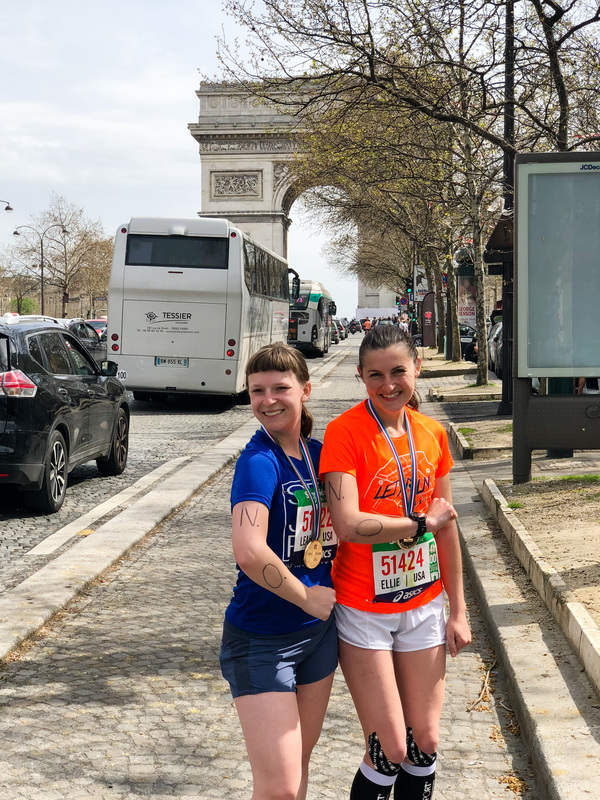 Though the prospect of running with one of my best friends in Paris helped push me through training, two other factors also did. One was that a blogger I had followed for some years, Meghan, also signed up for the race and as we started chatting and getting to know each other, we discovered we had loads of similarities. We ended up getting our pre-race dinner together (but forgot to take a photo, whoops), and it was really cool to meet in person. The second was the #ParisMarathon Girls Facebook group. Though the amount of posts admittedly got a bit overwhelming at times, it was a terrific resource and a great place to ask questions or share concerns. It also helped hype me for the race. Best of all, I reached out to the group about doing a run in Brussels the weekend before the race, and a woman named Anne invited me to join her run club’s outing in the Sonian Forest, which turned out to be great fun. Exploring Paris before the race. Notice I wore an old pair of running shoes to protect my feet since I was walking a lot! The race preparation had gone well, so I was feeling confidence alongside my nervousness by the time race activities rolled around. Because Ellie was working, we went to the race expo to pick up our bibs the day before the race and it was packed. Actually, the way to the expo on the metro was even more crowded than the expo itself. The hot metro ride over didn’t make me too keen on staying at the expo for a very long time, so we did a quick look around, got some items we needed for the race, and left. The morning of the race, I ate my pre-run standard of toast (with nutella instead of peanut butter and honey), wrote split times on my arm in sharpie, and Ellie and I wrote N.O. on our arms in honor of our late Russian professor. It was the second warm day of the year, and even in the morning it wasn’t too chilly which was good because we had to wait for our wave to start. I’ve never done such a large race, but Ellie, who has, also thought the congestion was an issue. It was difficult to get into our airlock, the lines for the portapotties were astounding, and getting to the starting line was a crush. This set the tone for the race: though there was a section in the middle of the race when it was a bit less packed, we were weaving the entire time. According to Ellie’s watch, we added more than a third of a mile in distance at least. It was also frustrating to vary our speed so much, especially since the key to running a strong race is holding an even tempo. The race course passes many of Paris’s landmarks, but I barely noticed them because I was too busy watching the people in front of me so I wouldn’t accidentally run into them. Though the intense crowdedness dampened my enjoyment of the race somewhat (I began stressing out about not making my desired time due to the crush and being caught behind people), the course itself was a nice one. Having trained in Seattle, it seemed quite flat to me though there are a couple of noticeable hills and a few ups and downs as you go through underpasses. Chunks of the race go through the parks Bois de Vincennes and Bois de Boulogne, which were especially welcome given the bit of shade on offer. One notable aspect of the race, at least from my U.S.-centric perspective, was the hydration stops. They were giving out actual water bottles, which I found fantastic. Here, people give out waxy paper cups, which are hard to drink out of, and then are tossed. The water bottles were easy to carry and drink from, and there were huge recycling bins with targets to toss the bottles in when finished. I found this more convenient and less wasteful. However, at the stops they also handed out fruit and banana and orange peels created a bit of a danger zone. I’m also more used to eating gels so I carried those with me instead. Ellie and I ended up able to keep pretty even splits throughout the race, despite having to weave through the crowd. It was excellent running with her, since when one of us lagged a bit, the other had some wind, and in that way we pulled each other along. I felt strong until about mile 23, at which point I think I was getting a little too dehydrated, but, with some whimpering, I managed to hold pace until the end. We finished in 3:52:12. I was very proud of this, since my original goal had been to make it in under four hours. Even better, I felt good running up until almost the very end. We crossed the finish line and immediately hugged each other. I was wiped after our sprint to the finish and really wanted some water, but they handed us our medals and shirts before our hydration, which I found slightly questionable. Nonetheless, once I had a bit of food and drink in me, I quickly rebounded and felt really happy. I would recommend the Paris Marathon if you don’t care much about your race time, or if you really want to do a race in Paris. It is a nice route and well-supported. However, due to the congested route, I wouldn’t recommend it if you’re attempting to set a personal record. That said, I did set a PR and I am really glad I did it, especially with my A+ race buddy! Love the analogy between solo travel and running. I wonder if there’s a direct correlation! Congrats on the marathon! Thanks, Erika! And yes, I wonder if there is, too. Not sure that anyone has done the research though! I’d love to do the Paris marathon someday! I’m running Berlin this fall and am a bit worried that the congestion will be in issue there as well. Well done! Oh, good luck with Berlin! I have heard good things so hopefully the congestion isn’t as rough as I found it in Paris. Would love to hear what you think afterward. Thanks for sharing this race information! I love seeing races through the eyes of other runners. 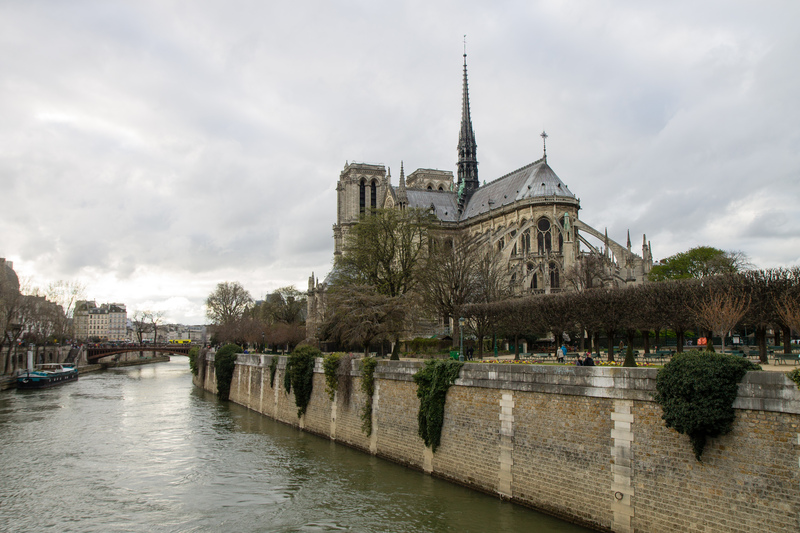 The Paris Marathon is a bucket list race for me, for sure. I appreciate the warning about the massive overcrowding!